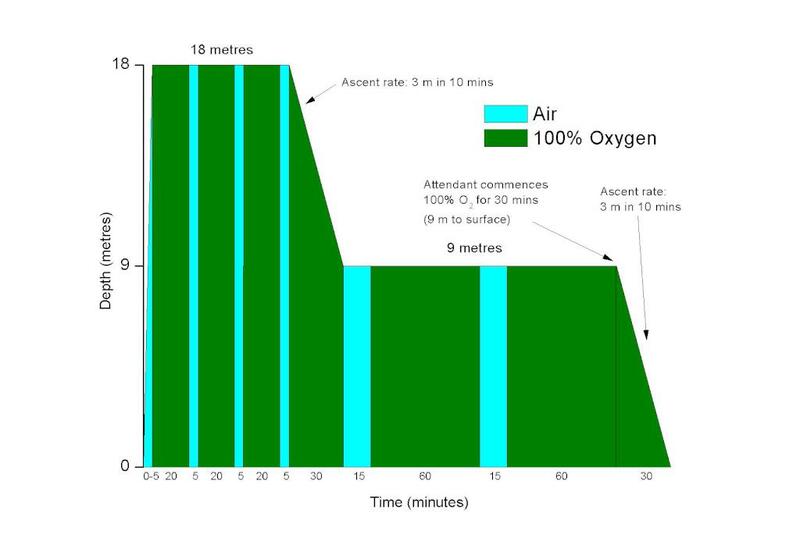 Hyperbaric oxygen (HBO) therapy is the breathing of 100% oxygen inside a treatment chamber at a pressure higher than one atmosphere absolute (1 ATA). In Hong Kong, up to 1994, recompression therapy was provided by the United Kingdom Royal Navy. After the Recompression Treatment Centre (RTC) was open in 1994 in Ngong Shuen Chau, HBO was operated by the Hong Kong Fire Services Department, with maintenance provided by the Electrical and Mechanical Services Department (EMSD), and medical supervision offered by the Occupational Medicine Division (OMD) of the Labour Department. There are some limitations of treating critically ill patients with HBO therapy in Hong Kong because the RTC in Ngong Shuen Chau is not only intended for medical uses but also for disciplinary forces training. It is not attached to any acute hospitals. There are only basic monitoring and resuscitative equipments and the environment is not spacious. The staff of the Occupational Health Division of Labour Department is also not specifically trained in dealing with clinical emergencies or resuscitation, nor is there nursing or clerical support. In case of unexpected clinical event, immediate support must be provided by the escorting doctor of the referring acute hospital. Although the HBO indication of carbon monoxide poisoning was equivocal and not widely accepted by critical care physicians in Hong Kong [1,2], decompression illness and cerebral arterial gas embolism are well accepted indications for HBO therapy and are widely recommended by various Healthcare Technology Assessment Agencies. The objective of this document is to suggest a management protocol to guide physicians to prepare for critically ill patients to safely undergo HBO therapy in Hong Kong. The benefits obtained from HBO therapy and the associated risks should be balanced by assessing the indications (Table 1), contraindications (Table 2) and relative contraindications (Table 3). The commonest reasons for referral from the Intensive Care Unit are usually severe carbon monoxide (CO) poisoning and decompression illness (DCI) . Because of the limitations listed above, the usage rate of the RTC for HBO therapy for critically ill patients remains low despite the fact that indicated cases for HBO therapy are common. In Hong Kong, from April 1994 to December 1997, 25 out of 39 (64%) DCI cases and 7 out of 39 (18%) CO poisoning cases had been treated with HBO . From 2006 to 2009, it was estimated that 59 out of the total 303 (19%) CO poisoning cases should have been indicated for HBO, but only 4 out of the 59 (6.8%) cases had been given HBO therapy . About staff occupational safety, before entering the chamber, the staff must make sure that he/she should have a normal Eustachian tube function (e.g. which may be compromised by a recent upper respiratory tract infection), have no history of pneumothorax, obstructive or restrictive airway diseases, chest surgery and have not undergone recent diving. Pregnant doctors are not advisable to enter the chamber. After caring for a patient inside chamber, the staff should be advised against flying or diving for at least 24 hours. The staff should learn to recognize the symptoms of complications of HBO and seek treatment, especially regarding barotrauma of the eardrums and decompression illness (DCI) like joint pain, numbness, weakness, etc. Consult the doctor of the Occupational Medicine Division of the Labour Department urgently if DCI is suspected. Preparations before HBO therapy have to be made, mainly based on the principle that enclosed air within a cavity varies in size (Boyle’s Law) with different pressure, and the pressure exerted anywhere in a confined fluid is transmitted equally in all directions throughout the fluid (Pascal’s Principle). As middle ear cavity pressure changes with the ambient pressure, the patient may need bilateral myringotomy before HBO if he/she is not able to equalize the middle ear pressure with outside pressure, e.g. in coma or under sedation for mechanical ventilation. For patients with endotrachael tube or tracheostomy tube, replace air with water for cuff inflation. For intravenous therapy during HBO therapy, avoid glass bottle and rigid plastic bottle because of the risk of implosion as a result of vacuum developed during infusion if the air-vent blocked. Trapped air inside bottle during ascent may cause an increased rate of infusion and also increase the risk of air embolism. Collapsible bag is preferable, but make sure there is no bubble in the tubing. Safeguard against disconnection. Intravenous infusion pump or syringe pump with battery should not be used unless it is purged continuously with nitrogen because of fire risk. But as nitrogen purging is not available in the RTC of Ngong Shuen Chau, we must seriously justify HBO therapy for a patient who requires inotrope / vasopressor administration with an intravenous infusion pump. For the nasogastric tube, open to a collapsible bed side bag, and perform intermittent suction, especially during the last minute of ascent. For Foley’s catheter, ensure that the balloon is filled with water and not air. For central venous line, try to avoid trial of subclavian puncture in a patient who is to be considered HBO because of the risk of an undetected lung puncture resulting in pneumothorax. Before entering the chamber, make sure all materials and equipment inside the chamber are HBO compatible; if in doubt, do not bring into chamber. The following items should be strictly prohibited inside chamber because they are potentially inflammable and/or may lead to explosion from air pressure changes: cigarette, match or lighter, oil-based cosmetic, face cream, body oil, hair spray, nail polish, nylon clothing, ink-filled pen, electronic instrument, pager, mobile phone, watch (except the type for designed for diving which contains no battery). During HBO therapy, if any medication injection is required, avoid the intramuscular or subcutaneous routes because hyperbaric therapy-induced vasoconstriction could cause delayed or erratic absorption. For intravenous administration, give by bolus or by infusion by drop count. The drug is better prepared by somebody outside the chamber and transferred into the chamber via the air-lock. This is because any attendant inside may be prone to error judgment as a result of increased nitrogen absorption during pressurization. Defibrillation should not be done inside the chamber under pressure because of fire hazard, and should only be done when the patient was surfaced. For suction, a hand-held aspirator with in-line trap and vacuum regulator can be used. For monitoring during HBO therapy, anticipate probable and possible complications (Table 4), including barotrauma (in ears, sinuses, lungs, tooth caries/fillings), oxygen toxicity (convulsion), CO2 narcosis (decrease in conscious state), nitrogen narcosis (euphoria, hallucination, coma), decompression illness, claustrophobia, reversible worsening of visual acuity and transient gastrointestinal pain. Important parameters to monitor include the conscious state, presence of cyanosis, chest movement and pulse rate. Inside the chamber, there is a built-in multi-parameter physiological monitoring system for the monitoring of vital signs including ECG, heart rate, SpO2, plethysmography, respiratory rate, capnography and blood pressure. For invasive arterial pressure monitoring (continuous), the pressure bag volume and pressure should be monitored during descent and ascent. No bubble is allowed within any tubings. Zero the pressure transducer with reference to chamber pressure in the standard way. For non-invasive blood pressure (intermittent), it is made preferably by the automatic oscillometric method; mercury sphygmomanometer should not be used to avoid the risk of spillage of mercury and the resulting contamination. While the monitoring module is placed inside chamber, the monitor screen should be placed outside chamber. No monitor with hot-wire stylus and no battery-run monitor should be allowed inside the pressure chamber because of fire risk. For pulmonary artery catheter (Swan Ganz catheter), the balloon port should be left open if not measuring wedge pressure. Measuring wedge pressure during descent/ascent is not advisable. For arterial blood gases analysis, when a specimen taken inside the chamber and analyzed at surface, the pH and pCO2 are reasonably accurate, but pO2 must be analysed with a specially adjusted equipment within the chamber, or otherwise expect a spurious result due to the “off-gassing” effect. 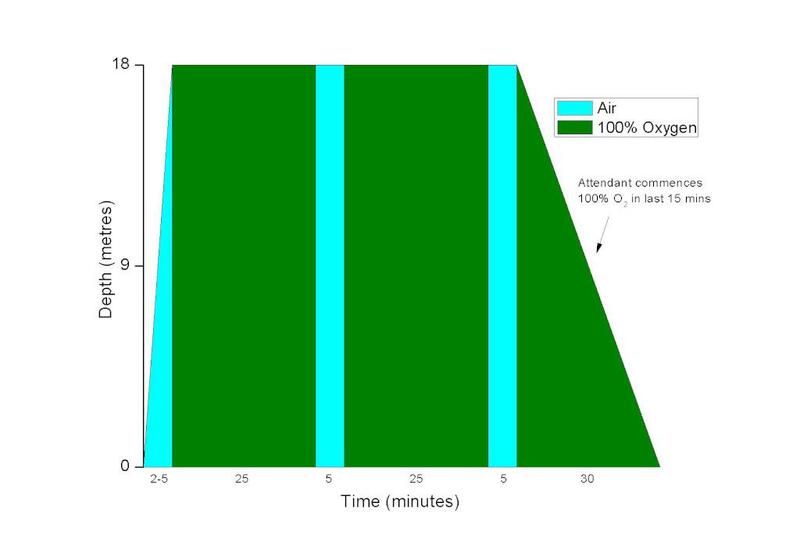 The effect is due to the fact that O2 gradient between blood and bubble is higher at 1 ATA than 3 ATA, therefore, O2 would tend to escape from blood to bubble faster at 1 ATA than at 3 ATA, hence a spuriously low PaO2 at 1ATA if at which it is measured outside the chamber. Prepare a chest tube drainage system ready within vicinity of chamber for emergency chest drain insertion for pneumothorax. Monitor chest drain box air-fluid level during descent and ascent. For patients already with a chest drain, the drain box may be substituted with one-way Heimlich valve for easier management. Figure 3 shows the ventilator circuit for use inside the chamber. Oxylog 1000 (Dräger Medizintechnik GmbH) is to be used for mechanical ventilation inside the hyperbaric chamber because it is the only ventilator available at the RTC of Hong Kong. When the chamber pressure is increased, the tidal volume delivered to the patient will diminish accordingly and the scale on the ventilator no longer reflects the actual volume. To solve this issue, one may refer to the calibration table provided by the chamber, or one may use a Wright’s spirometer, with prior calibration to make sure that it is accurate, which can be connected to the ventilator circuit for tidal volume monitoring. Expired gas from the patient should be scavenged through a tubing and not be dumped into the chamber. There is a build-in-breathing system for patients able to breathe on his/her own, but first make sure that the patient can trigger the demand valve and is not breathing chamber air. 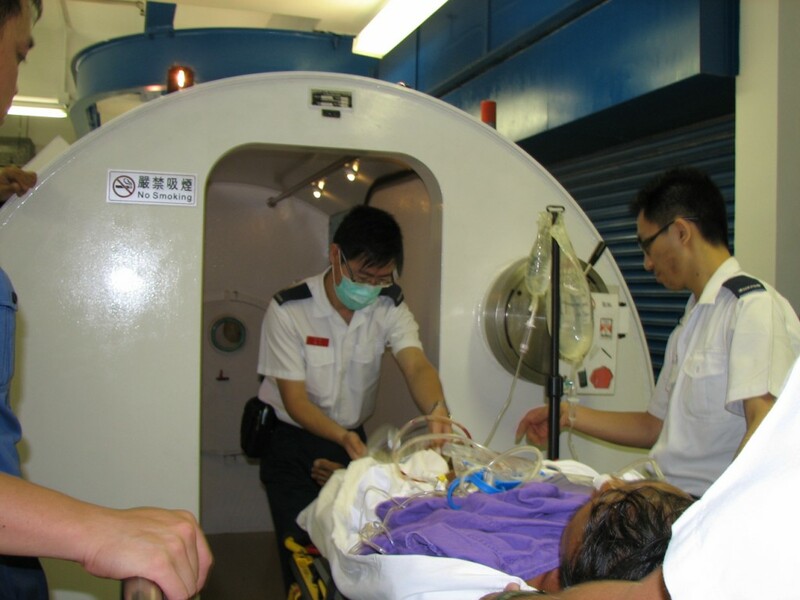 It is hoped that in future an in-hospital HBO treatment centre of adequate space can be set up in Hong Kong with trained medical, nursing and technical staff to provide hyperbaric therapy and consultation. Multiplace hyperbaric chambers are preferred. Quality Assurance, training and research programme should be set up. The commissioning of an in-hospital HBO treatment centre calls for the vision and dedication to patient service by the following parties, namely, medical specialties (especially critical care medicine and emergency medicine), the Hong Kong Hospital Authority and the Hong Kong SAR Government. 2. Weaver LK, Hopkins RO, Chan KJ, Churchill S, Elliott CG, Clemmer TP, et al. Hyperbaric oxygen for acute carbon monoxide poisoning. NEJM 2002 Oct;347(14):1057-67. 7. Undersea and Hyperbaric Medical Society, www.uhms.org .